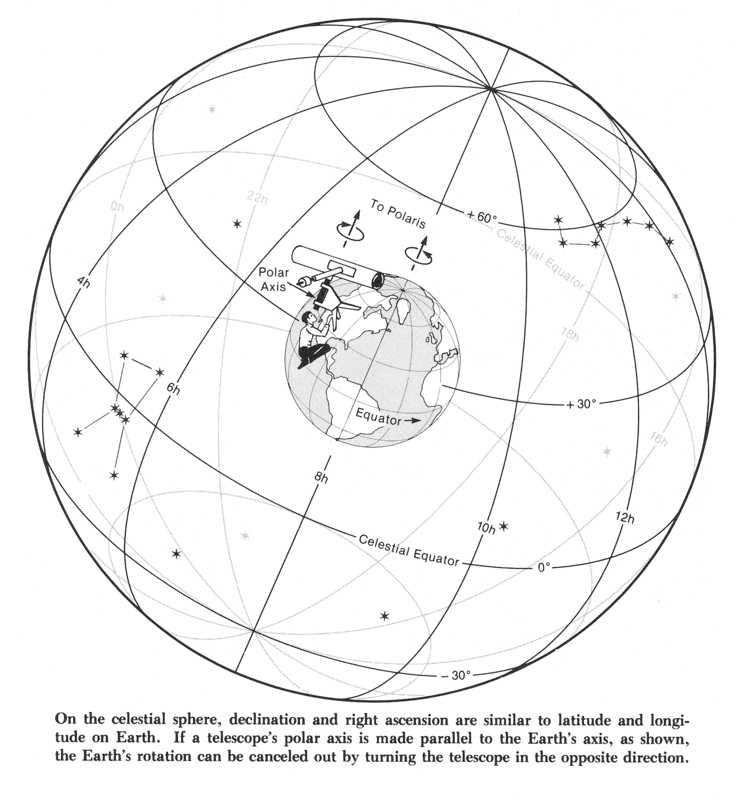 Coordinates, Time, and the Sky by John Thorstensen A very nice 36 page pdf file. You will probably want to print this out. Specific pages to read given in homework 7. Annotated sky calendar. Astronomers use calendars such as this to see what is going on each night. 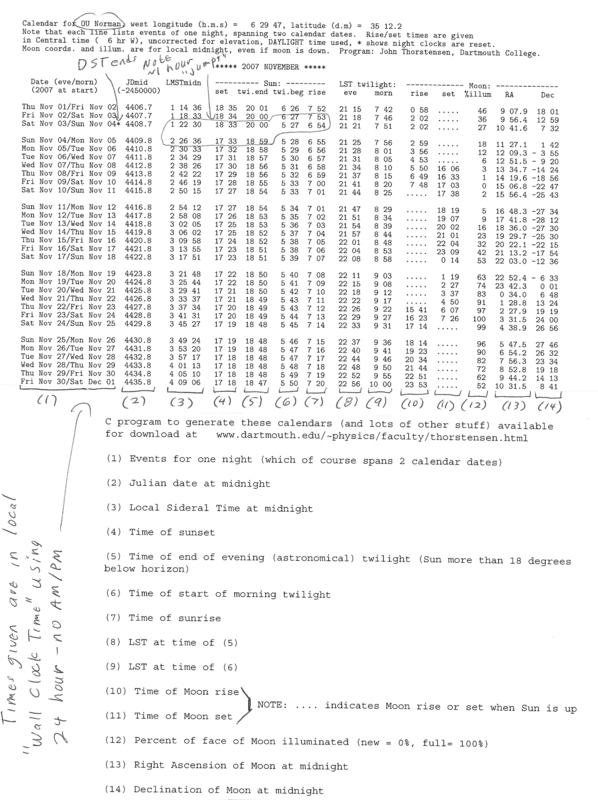 As the times for sky phenomena (sunset, LST at local midnite, etc) depend on the observers position on the earth, a calendar such as this must be custom computed for each earth position. Sky&Tel grapical almanac Sky and Telescope magazine (you all have subscriptions, right?- HOW CAN YOU BE $MAJOR AND *NOT* HAVE A SUBSCRIPTION?!?!?!?!) 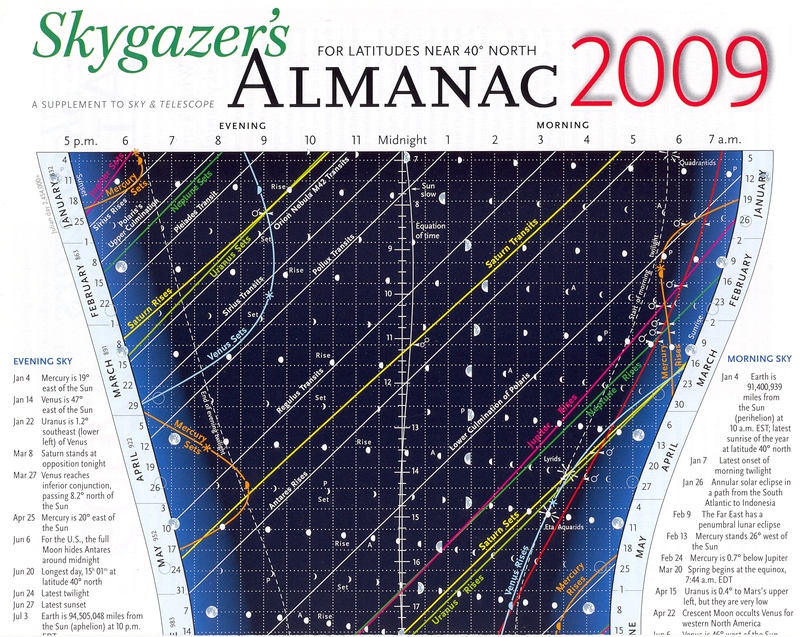 publishes the "Skygazer's Almanac", a nice graphical almanac that shows what is happening in the sky each year, particularly when the planets are visible. Effects of precession. The Earth's rotational axis precesses, much like a spinning top. The precessional period is about 26,000 years. 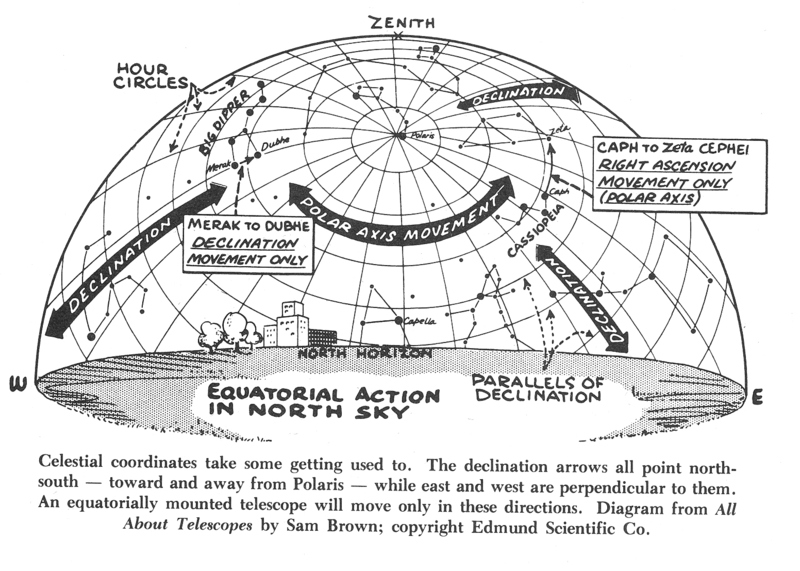 Because of precession, the celestial poles and equator move around the celestial sphere. At present (left hand diagram) the star Polaris in close to the north celestial pole, and is called the North Star. In 13,000 years (right hand diagram) the pole will be located near the star Vega. Of course, its not the stars that have moved, but the Earth that has "wobbled"! 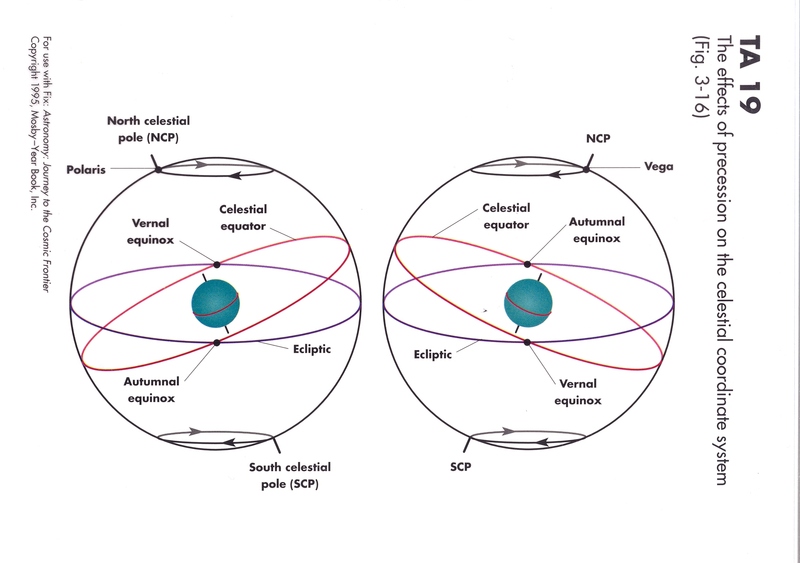 (1) Celestial sphere _(2) RA and DEC Two diagrams that will help visualize celestial coordinate system. The LST (local sidereal time) is the RA that is on the meridian for your location at any instant. People at other longitudes will have a different LST at that same instant of time. People at different latitudes but the same longitude (directly morth or south of you) will have the SAME LST as you at the same instant of time. 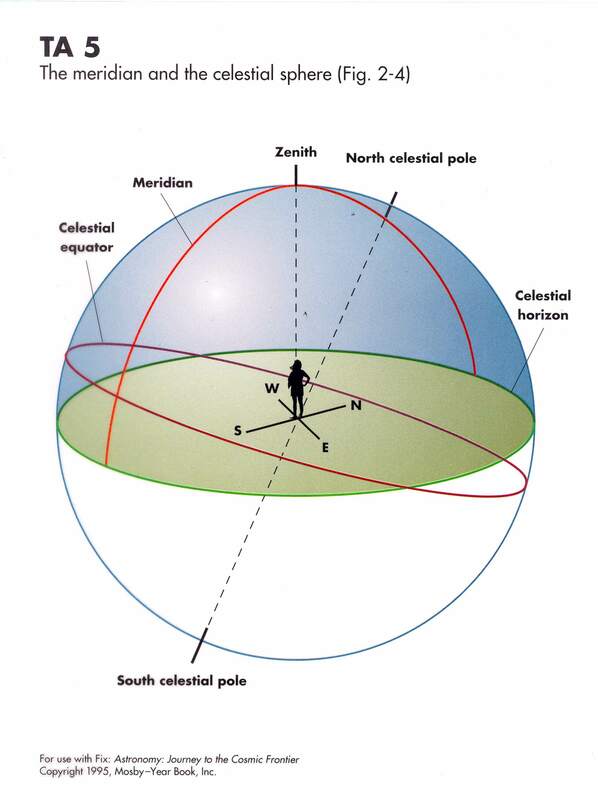 Meridian and celestial sphere. The zenith is the point directly overhead from your location. The meridian is a cicle passing from straight north, through the zenith, and on to straight south. As the Earth turns, objects (except those near the poles) appear to rise, reach maximum altitude as the pass the merdian (transit) and then set. The celestial equator is a great circle 90 degrees away from the celestial poles- it can also be thought of as an extension of the plane that coincides with the equator of the Earth. 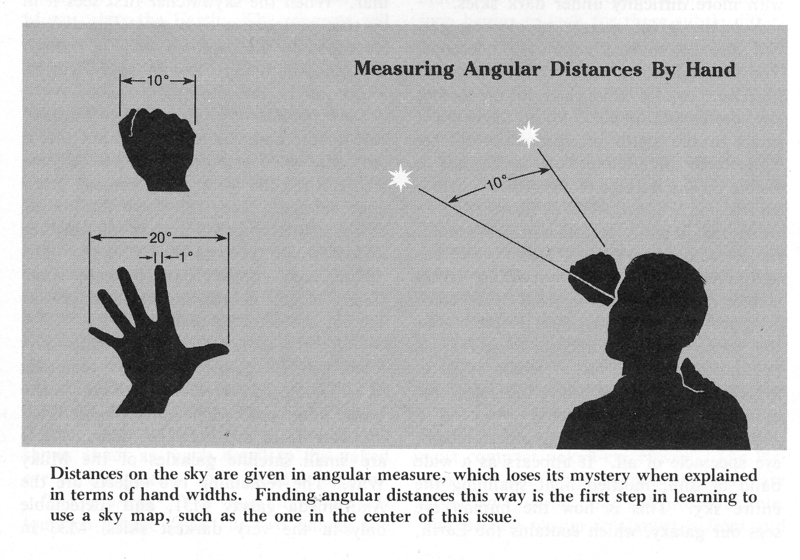 (1) Big Dipper angles _(2) Hand angles References useful in estimating angles on the sky. People's hands have different sizes, of course, but the ratio of hand size to arm length (which is all that matters for measuring an angle) is more constant than size alone. These angles are with arm fully extended.